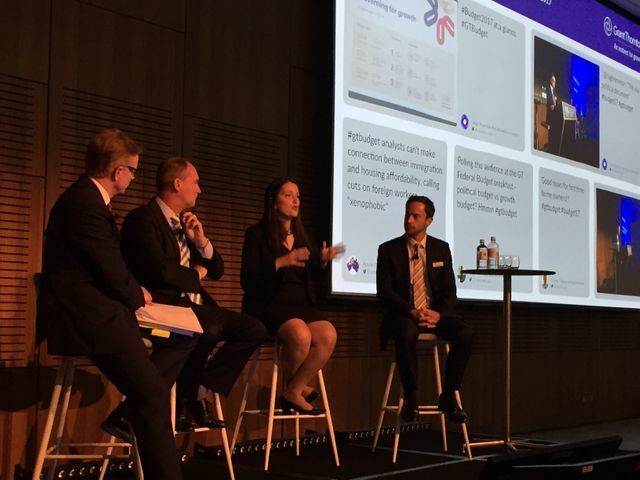 It was interesting to hear expert political and economic commentary from journalist Hugh Riminton and St George Bank Chief Economist Besa Deda at this morning's #GTBudget breakfast at the fabulous new Sydney International Convention Centre (ICC). 1. Hugh Riminton led out with a statement that this was a politically savvy budget from Morrison and Turnbull. Gone are the days of a harsh budget in the first year of a newly elected government with a view to winning back voters with handouts 2 years later pre-election. With the back room party back stabbing, Turnbull has no such luxury and this needed to be a voter friendly budget! 2. Whilst the big commitments to infrastructure spending seem to make sense and will certainly fuel short-term growth, the question of driving long-term sustainable growth comes down to the project selection and some of this is less clear cut. The inland rail project will appease the voters in much of regional Australia in the short-term but will this investment achieve a sensible ROI in the long-term? 3. Household consumption is currently "moderate" according to Besa Deda and our continued economic growth is reliant on an increase in this. But with wage growth the lowest in decades (below 2%) and more tax via the medicare levy increase and continuing challenges to housing affordability (particularly in the major cities - Sydney home prices now 10 x average wages - the highest ever! ), this looks unlikely. 4. In the wake of Brexit and Trump, with the rise again of One Nation, there was clearly a flavour to the budget of isolationist policy (targeting multinational tax avoiders, foreign workers, foreign resident investors, foreign property owners etc). The room clearly felt this was bad for business and a real shift from Australia's economic platform since the Keating era. But overall, from a Turnbull government that has been uninspiring to date (to say the least), I'd give this year's budget a 7 out of 10. While committing to continued growth and a budget surplus by 2020-21, the government has acknowledged the nation’s prosperity is not being evenly shared. This is an urgent challenge as Australia’s economy confronts globalisation, technological change and the end of the mining boom. The budget targets Australia’s big five banks, multinational tax avoiders, foreign workers and foreign resident investors, while making voter-friendly announcements in relation to health, education (particularly schools funding), infrastructure spending and housing affordability.